Thermal paper is a special fine paper that is coated with a chemical (containing BPA) that changes color when exposed to heat. 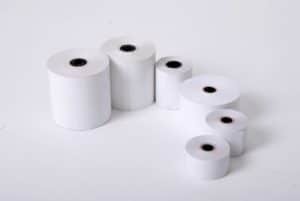 It is used in thermal printers and particularly in inexpensive or lightweight devices such as adding machines, cash registers, and credit card terminals. Compatible with: Samsung Bixolon, Epson, Lukhan, Birch, Star Miconics Citizen, Seiko, IBM, Aures.